Origins Of is a new Middle Eastern-inspired pop-up taking place at Blessings in Commercial Street, near Spitalfields Market. Running from 7th April til early June, it's on Thursday to Saturday evenings, and the menu will focus on simple but quality food. "Origins Of will launch its first kitchen takeover in Spitalfields, hosted at the independently run venue Blessing’s from April 7th. 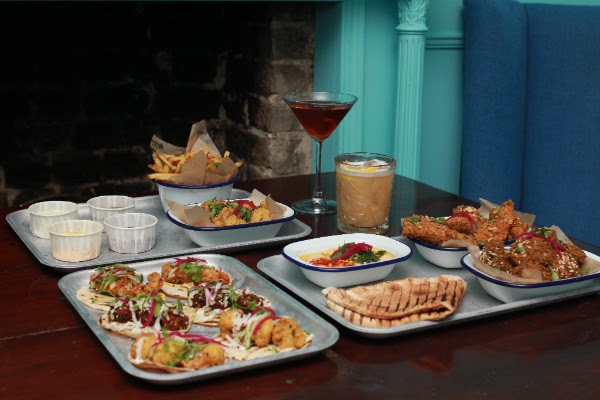 Abdulla Amin and Hugo Toland’s Middle Eastern-inspired take on traditional recipes will bring a new flavour to the plates of Londoners. Friends for over 20 years, Abdulla Amin and Hugo Toland are out to introduce new ideas and flavours to the palettes of forward-thinking Londoners via Origins Of. The concept takes classic Middle Eastern ingredients, remixing them for a new audience. Abdulla, who left a professional career to pursue his lifelong passion for food, along with Hugo, a consultant whos projects have included dining powerhouse Street Feast, embarked on an adventure to create a fresh take on classic dishes. The three main offerings of spice infused fried chicken, buttermilk soaked cauliflower florets and a vibrant twist on the classic falafel are served dressed on three mini charred flat breads, as a basket or sharing platters with a selection of sauces including; Tahini Hype, Scotch Bonnet Mayo, Fresh Sweet Chilli, Honey Mustard BBQ and Sumac Yoghurt. The recipe development began over three years ago when Abdulla was living and working in Kazakhstan. In the absence of any buttermilk Abdulla was forced to create his own unique recipe. Items including the hummus and pickles will be handmade by Abdulla’s mother using recipes handed down through the family’s Middle Eastern heritage. The menu is focused on a simple but quality offering. Free-range herb-fed chicken and vegetables from New Covent Garden Market are paired with flatbreads from a secret London supplier whose produce is in demand across Europe."